Every good camping equipment needs the suitable tool for emergencies. If you get into a wild storm, your tent, an awning or a sew will be easily torn apart. 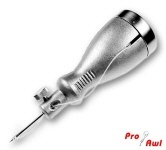 In this cases the Pro-Awl is the best choice. Due to its handy format (3,5 x 9 cm) it fits into every toolbox or trouser pocket. Inside the hollow metal handle there is a bobbin with extra stable thread, a set of industrial needles and a helpful shuttle. A multilingual operation instruction is always included and explains step by step how to sew. Everybody will be able to produce professional seams after a very short practicing period. Like this the camping holidays can gladly continue. Further information at www.pro-awl.com.